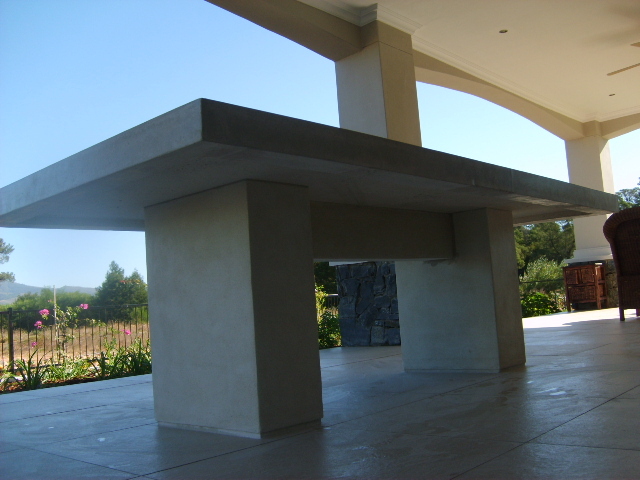 Stonecast concrete table tops are made up to specification. They are smooth and sealed with the same sealer used on our kitchen tops. This is UV resistant and so functions perfectly outside . The minimum thickness of the slab is 60mm in order to accommodate the steel reinforcing that is cast in it , but thicker slabs up to 100mm are also popular. 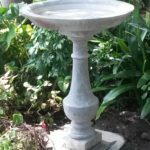 The table bases can be made up in various designs and materials like wrought iron, wood, stainless steel and concrete. All these must sufficiently support the slab. The benches are also made up to size and design , but we do have an all-in-one design bench called the Forum Bench in our production range in 2 sizes: 1.8 and 1.5 long. Our other benches are the Griffin Bench, the Stonecast Bench with more classic styling, The Legno and the Owl seat. These concrete tables and benches are very heavy so their position on sight is permanent. Soft furnishings for the benches add comfort .